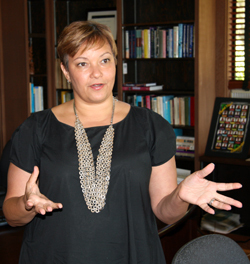 Before delivering her commencement address, Jackson visited University House. 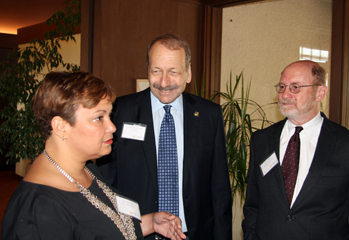 Jackson visited with Chancellor Blumenthal and guests, including John Laird, right, (Stevenson, '72, politics) California's Secretary of the Department of Natural Resources. 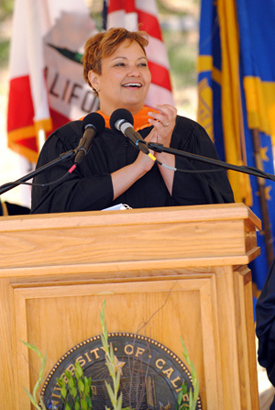 In her College 10 commencement address June 12, Lisa P. Jackson, administrator of the U.S. Environmental Protection Agency, said there are plenty of good reasons for her to be on the UC Santa Cruz campus. "Your school's work on behalf of the environment is nationally recognized," she said, citing UCSC's top 10 ranking on national polls of eco-friendly colleges. "You are doing your part to make our communities cleaner, healthier, and more sustainable." Jackson spoke of her commitment to environmental justice and lauded College 10's focus on social justice. "You've learned here that part of social justice involves environmental justice—making sure that all Americans receive the same protections that ensure clean water and air and healthy communities." Earlier at a luncheon with Chancellor Blumenthal, environmental studies faculty, and local political luminaries, Jackson spoke of the important connection between health and the environment. The nation will save $2 trillion between 1990 and 2020 that otherwise would have been spent on health care costs if not for the Clean Air Act passed in 1970, she said. She praised the UCSC campus for taking a "love of a place and turning it into policy and practice." Jackson's visit to UC Santa Cruz was her first, though she'd been to Monterey. "It's hard to get here," she quipped, "but I wouldn't miss it. It's an honor to be here." Jackson, who earned a masters degree in chemical engineering from Princeton, was a 16-year employee of the EPA before she joined the New Jersey Department of Environmental Protection, rising to head the department. In 2009, President Obama appointed her as the first African American woman to head the EPA. She told graduating seniors that she became "a full-fledged" environmentalist after the Love Canal disaster discovered in the late 1970s when buried toxic sludge began oozing into basements in Niagra Falls. "I remember the day its greatest lesson hit me," she said, "if engineers can invent the processes that create all this waste, engineers would have to invent the processes to fix it." She spoke of her career path and doubts along the way, of her father's influence as a mail carrier in New Orleans and his commitment to the people on his route. She also spoke of growing up in New Orleans' Ninth Ward and how her mother's home was destroyed beneath eight feet of floodwater after Hurricane Katrina. Jackson said one of her first trips as EPA administrator was back to New Orleans to monitor the city's recovery. Jackson, the mother of two teenaged sons about to enter college, told the new graduates some may say to them: "Social justice? What will you do with that? "I am telling you to learn to trust your passions and decisions as you take your place in this new world of adulthood and self-responsibility."